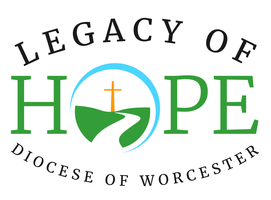 Bishop McManus invites you, as a faithful member of the Catholic Church in the Diocese of Worcester, to bring your gifts and add them to the gifts of others in order to raise $32 million. As a good steward, you are called to reflect on the abundant gifts from God, to consder all the ways your life has been blessed, and to return to God in the same measure that He has given to you; in order to help provide the foundation for the future. For these reasons, everyone is asked to give, but not everyone is asked to gove the same amount. There is a gift plan in this brochure that can be used as a guide in making your decision to support the Legacy of Hope Campaign. Please consider it carefully and select the gift that best expresses your gratitude. Your gift can be made as a pledge payable over a 4-year period on a montly, quarterly, semi-annual or annual basis. Reminders will be mailed to your home based on your pledge plan.